TWO EASY WAYS TO PARTICIPATE! 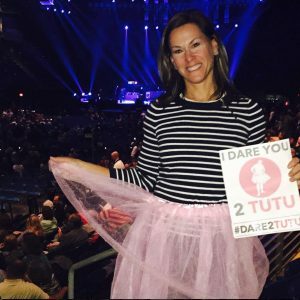 BUY A TUTU & SHOW YOU DARE! All you have to do is purchase a tutu, make a donation and show your support by posting pictures after you receive your tutu. Order soon and challenge yourself to take creative, fun pictures throughout the month of October. Every picture will help cheer someone’s day and inspire others to join our breast cancer fundraiser. The Tutu Project team will share your #Dare2Tutu images across our follower base of 20,000+ Instagrammers, 200,000+ Facebook fans and over 10,000 friends on Twitter. The most shared images will become eligible for giveaways throughout October, breast cancer awareness month! Think you want to do more and become a Tutu Project Advocate? Join our Facebook group to learn more. 1. Create your personal fundraising page. 2. Buy a tutu from us, a local store or make one! 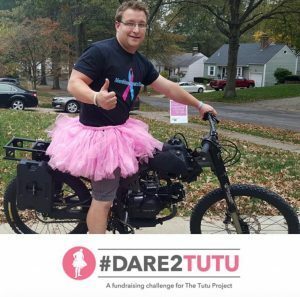 YOU MUST use hashtag #Dare2Tutu across social media, and tag us on Facebook. Favorite pictures and stories will be featured daily across our social media properties. Questions? hello@thetutuproject.com. This looks like a blast! Sign me up! Priyana is no ordinary teenager! Her heart is warm and giving. She dedicated the entire month of October to “posing for a cure“. She partnered with local beauty salons and businesses to market her campaign, which raised over $5,000 for families with breast cancer! Melinda volunteers for The Tutu Project throughout the year. 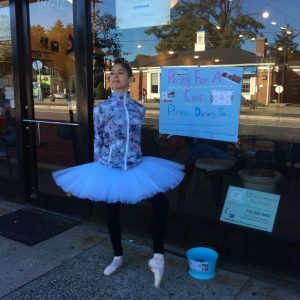 To raise the funds that earned her second prize in our #Dare2Tutu contest, Melinda asked friends to take pictures of her in her tutu everywhere. Concerts, cooking, and even her dogs participated! Visit her Instagram to see more of her creative efforts! Marshall and Shannon from For3Sisters are grant recipients from the Carey Foundation for the work they do for breast cancer patients. We couldn’t believe that Marshall “took it all off” and honored us by keeping the fireman helmet on.